GL1800 AUXILIARY LED LAMPS - 3.5" SoCalMotoGear.com - Professional Grade Motorcycle Lighting - Plug N Play Products - "Riding at night has never been brighter!" 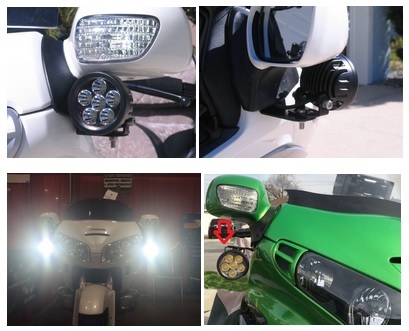 Six High Powered LEDs/18w of power and over 1100 lumens per light should please discerning riders. The PathFinderLED 1100 series spot lamps are fully adjustable, fully mountable Top or Upside down. If you are looking for the ultimate lighting upgrade and want more powerful lights, look no further! Get ready to look like a 747 coming down the road! These are rated for off road usage and can hold their grounds next to more expensive units that range over $500 bucks. Use these lights for High Intensity Lighting that will be sure to light up 2 lane highways or that pitch black country off-road. They are extremely bright, we only recommend them to be used for “Off Road Purposes”. (2) PathFinderLED 1100 series LED Auxilary Lamps and surface mount brackets with screws as shown. Due to different installation variations, these should be professionally installed. Note: These lights ship with bare wire connections for a flexible installation (Positive and Negative wire). You may require additional wiring and a switch to control the lights. POWER: 18W PER LAMP - DRAWS ONLY 1.1AMPS! USE EXITING FACTORY HOLES TO MOUNT BRACKETS.